The Jabba’s Prize set was released in 2003 as part of the Original Trilogy subtheme of Star Wars. Its low piece count of 40 put it in the range of a mini build though it was not marketed as such. The set really revolves around the minifigures and the Han solo frozen in carbonite depicted on a printed black brick. The set struggles to make a big first impression due to its small size but upon closer examination the viewer is rewarded with an immediately recognisable scene or scenario from the Star Wars movies. You can tell right away that it’s a frozen Han Solo being guarded by the bounty hunter Boba Fett and a one of Jabba’s gaurds. The set is designed to be paired with the 4480 Jabba’s Palace set that was released at the same time. It has the same tan color scheme etc and it does seem like they could have just included it in 4480 somehow. No doubt it came down to a marketing or money making decision to release it as a separate set. The black 1x2x5 brick with Han Solo captured in carbonite is not a minifigure per se but could almost be treated like one. It’s a significant part, and even though it appears in 3 other sets it still commands close to $6 in new condition. It is a definite driver of value for the set. In terms of other parts there are standard scattering of brown, tan, and grey elements included to make the structure surrounding Han. Nothing else too rare or expensive to drive the value there. Although the greys are the old type that was retired and replaced by the bluish grey shades, so is a little rarer. Building the set from the 40 pieces doesn’t take long, only a few minutes. Nothing overly complicated in terms of technique, just a nifty little hinge part that allows the Han Solo brick to tilt forward when released via a latch from above. The finished model has a small amount of playability. The minifigures provide the main play options. There is also the aforementioned hinge component so you can recreate the moment where Han encased in carbonite comes crashing to the floor. (well he doesn’t crash to the floor here but tilts forward at least!). Playability would be greater enhanced when paired with its sister set the 4480 Jabba’s Palace. Retailing at $7 new this set was well over the accepted benchmark of $0.10 per piece at a whopping $0.175. However, I don’t thing this is a fair reflector of the production costs and subsequent pricing of this set. There are 2 great minifigures, which means you got them for $3.50 per minifigure if you averaged it over the set. There is a bit of a loose rule that $10 per minifigure is good value, so we are well under that. Plus the Gamorrean Guard minifigure would have been a completely new mold, so cost to produce would be high. The Han Brick would also increase production costs. Price per gram was $0.075 and that puts it on par with the average of the mini building sets that were released around the same time. Most of the pieces in the set are larger that you’d expect in a mini build so the amount of raw plastic you get represents good value for money. So I think we can say that value for money at retail was overall quite good. So the total of $66.57 is more than $30 above the current market price for a new set of $36.13 on Brickpicker. This would suggest that there is potentially a profit to be made in buying a new set and parting it out. One caution here though is that the box itself has only one listing for $24.24 and is probably an unrealistic price. If we adjust that down to a more realistic $5 we come to a potential parting out total of $47.33. It still looks like there could be some profits in parting out. Though you would have to take into account possible selling fees and the opportunity cost of the time involved to do so – which would deteriorate some of that margin. This may make the proposition unprofitable or at best break even. The Star Wars theme is very high in terms of popularity I think only City outperforms it in sheer numbers sold. It has to score highly for this. Also the Original Trilogy subtheme is probably the most sought after for collectors, possibly only behind the highly prized UCS line. Star Wars Lego appeals to two main collector groups. Star Wars Fans and Lego Fans. Sets from this theme have the ability to pull in non-traditional Lego buyers who collect Star Wars toys or memorabilia. There are a lot of them out there; Star Wars would have to be one of the most collectable franchises around the world. Therefore this drives demand for Star Wars Lego beyond the normal Lego fan. CAGR by Theme on Brickpicker shows Star Wars as averaging 9.27% across the theme, which is below the total Lego average of 11.36%. However, this can be a little misleading as the theme CAGR includes sets that are still available at retail outlets which almost always have a negative return due to purchasing during specials or discounts. If only EOL (End of Line) sets were taken into consideration this would be a lot higher I’m sure. The set was not exclusive to any particular retailer. Just a standard 2003 release across all Lego retailers. Nothing much to add to potential value here to really pump up the secondary market value through scarcity of supply. A fairly straightforward small box for this little set. The design was the standard Star Wars one of the time with the Lego logo top right on a star filled space background that then fades into an atmosphere of a planet that is outlined in a quarter circle. Within the quarter circle is a front on shot of the model with the two minifigures diligently standing guard. There is some motion blur on the Gamorrean’s axe and on the Han Brick implying its ability to be dropped forward. As I mentioned previously there was only one box for sale I Bricklink that I could see at time of writing and that was asking $24.24. A little unrealistic for a small box on a fairly old set like this. Though the scarcity of the box is possibly a small driving factor for the overall value of the set in new condition. This set has had a CAGR of 17.85% over the decade since its release. That is an excellent growth rate and represents a return of 417% on initial investment (ROI) if you bought one at retail (or 5.2 times retail price if you prefer that measure). Not many Lego sets have sustained that level of price growth after the end of its retail life and those that do are often talked about glowingly by investors and collectors alike. Even more staggering is if you bought the set at a discount, lets conservatively say 20% off, then that would mean an ROI of 546% (6.5 times the price you paid for it)!. No doubt this set would have seen such discounts and perhaps more over its retail life. In fact, as an exercise, lets look at a realistic best case scenario; 2 year shelf life at retail and a 25% off (it could even have been more perhaps?) sale at the end of its life to clear stock. So you buy it at that time and your CAGR would be 27.3%, ROI of 589% (6.9 times retail). Excellent stuff! This is the reason many people have flocked to the Lego investing game. Find sets like this at good discounts near the end of retail life and cash in years down the track. Looking a little closer you can see that the return over the last 12 months has actually been -11.73%. That is on a sales volume of 71 new units sold on Ebay US. So a bit of a drop in the price after a number of stellar growth years. One factor for this drop could be the recently released 9516 Jabba’s Palace set. This set will have undoubtedly cannibalised some of the demand for Jabba related sets from our subject set. The New 9516 even has a Han Solo carbonite brick that looks very cool and actually has an imprint of a Han minifigure in it rather than a simple printed brick like we have here. Yet another example of remakes affecting the secondary market value of the original model. I’d also like to examine the volatility of prices on Ebay US using recently added data information on the sets Brickpicker page. 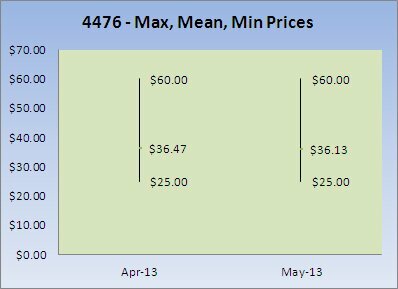 Below is a simple “Stock Chart” that shows the minimum, average, and maximum prices that the set sold for in new condition in the past two months. We only have two months to work with so there isn’t much in the way of time trends to analyse yet, but our ability to do so will improve as we move forward gathering more of this data. What we do see is a fairly wide gap of sales points for the set in both months. Condition of new sets can vary somewhat and will account for some of that price variation as a mint set will probably sell for more than a set with plenty of wear or damage to a box. Though the information does tell us that buyers are willing to pay up to $60 for a good set. If you had a set to sell you could price it accordingly along the scale depending on your sets condition and possibly other factors such as your Ebay reputation. From the evidence present it would be easy to conclude that the times of growth are over for this set. The recent trend of negative growth would suggest that. However, I think that onvce the 9516 set retires we should see this set return to a more modest growth path and follow along at perhaps around 5% per year, mainly underpinned by the minifigures. The new Star Wars movies may help, but it is a long shot as the subject of the set as little chance of being revisited in the movies. As stated in the intro this set doesn’t draw attention to it when on display due to its small size. This does mean that we have a small footprint, meaning it takes up little room on a shelf or desk so it is physically easier to display. Closer inspection by a visitor does reward though, mainly in seeing Han in carbonite and checking out the minifigures. The set looks good when combined with its sister set the 4480 Jabba’s Palace. Though 4476 is somewhat lost as a standalone set and you would just think that the two combined sets were one. Both lack a little polish when compared to the newr 9516 Jabba’s Palace. The newer set really does look a lot better in both design and accuracy. It really shows how far the Lego designers have come over a decade when you compare the two. I have enjoyed looking at this set in a bit of detail. There are some good points that have or should drive investment value, namely; Great rare minifigures, decent value for money, and a strong price growth history sustained over a long time period. Whereas on the flipside of that there is the negatives of a recent drop in growth probably brought on by another “case of the re-makes”, the small size of the set, and the perplexing reason (from a design perspective, not a business one) of its very existence when it could just have been part of another set. Personally I wouldn’t be buying one of these for investment, but if you can score a bargain you could make some profit longer term if the set bounces back to normal growth. In my opinion Jabba’s Prize is not a current investment prize.